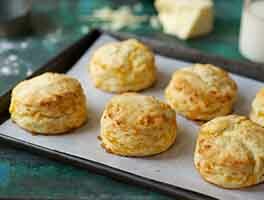 These biscuits are pleasantly crunchy on the outside, moist and tender on the inside. 20 mins. to 29 mins. Place the flour in a bowl. Work in the butter or shortening just until crumbs are the size of large peas. Add 2/3 cup of the milk or buttermilk, and stir until the mixture holds together and leaves the sides of the bowl, adding more milk or buttermilk if needed. Roll or pat the dough into a 5" x 8 1/2" rectangle about 1/2" to 3/4" thick. Cut biscuits with a sharp, round 2" cutter, dipping the cutter into flour between cuts to reduce sticking. Or cut the rectangle into 12 small rectangular biscuits, which will allow you to skip the step of re-rolling and cutting scraps. If you've used a round cutter, pat the scraps together, and cut additional biscuits. Place the biscuits on an ungreased baking sheet, leaving about 1" between them for crisp biscuits. Arrange biscuits so they're barely touching for soft-side biscuits. For higher-rising soft-side biscuits, place biscuits in an 8" round pan. Yield: about 1 dozen 2" biscuits. To make a sweeter, shortcake-type biscuit, add 3 tablespoons sugar to the flour, and 1 teaspoon vanilla to the milk. 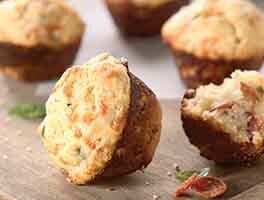 For cheese biscuits, mix 1/2 teaspoon dried mustard and a pinch of cayenne pepper with the flour; work in the butter or shortening, then toss in 1 cup shredded cheese before adding the milk. Don't have self-rising flour? 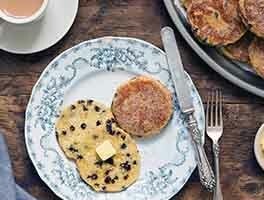 Try our recipe for Biscuits using all-purpose flour. 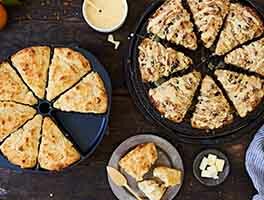 Coming from a first time biscuit maker this recipe was amazing! Goes great with my homemade sausage gravy!! This will forever be my go to recipe! I lessened the amount of milk and used 3 tablespoons of honey. They were perfect for strawberry shortcake. 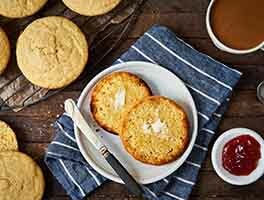 These delicious biscuits are a hit with my family. Quick and easy to prepare. From now on this is my go to recipe! Quick, easy & delicious. Rose beautifully with obvious layers from the butter. It was surprisingly nice to not have to measure out the leavenings and salt in my usual recipe. I thought the softer wheat might make a difference, and it did. Thank you. I absolutely love this recipe. I have one question. 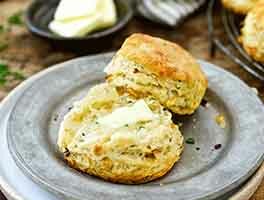 How do I get the tops of the biscuits to get slightly golden brown while keeping the inside moist? Should I brush the tops with egg white before baking? Or brush the tops with melted butter about 8 minutes into baking them before putting them back into the oven for the last few minutes? I baked these biscuits for the first time today. I used fresh self-rising flour, cold butter, and cold buttermilk. I did not exceed the amounts for any of the ingredients. I patted the dough into a rectangle, and used a sharp, big pizza cutter to make 12 squares. I had to bake them longer than the stated 10-14 min. period in order to get a wee bit of browning on some edges. They barely rose, if at all. My flours are stored in KA airtight plastic buckets in a closet that shares a wall with our attached garage. The only thing I can think might be the cause of the un-rising is that the flour temp was too cool. Could this be a reason? The closet is not like a refrigerator, it is just a few degrees cooler than the rest of the 71° house. I hesitate to try this recipe again, even though it was so easy. I will stick with standard flour biscuit recipes, I guess. Wow, so easy and delicious! This is now my go-to biscuit recipe. Best biscuits I've ever made. Family loved them.